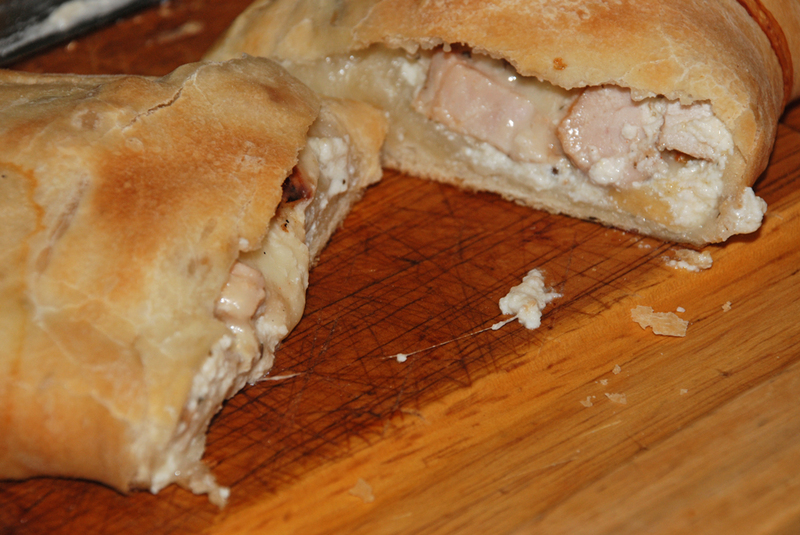 This recipe is an adaptation from Veronika at http://eattheroses.wordpress.com. 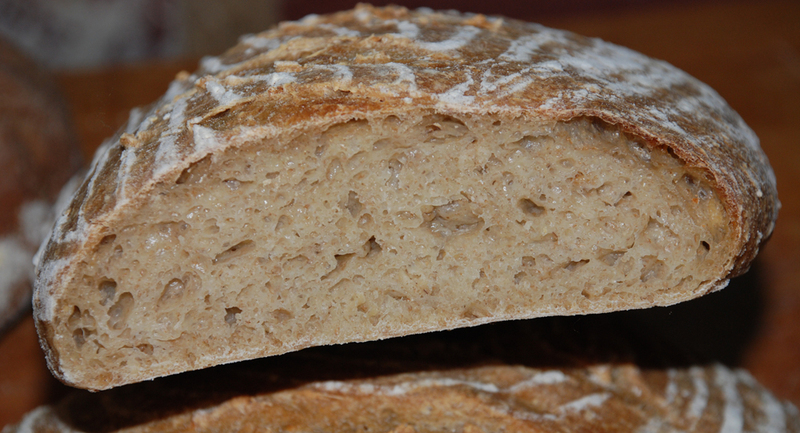 It uses the no-knead method and allows the gluten which is very weak in rye breads to develop slowly. 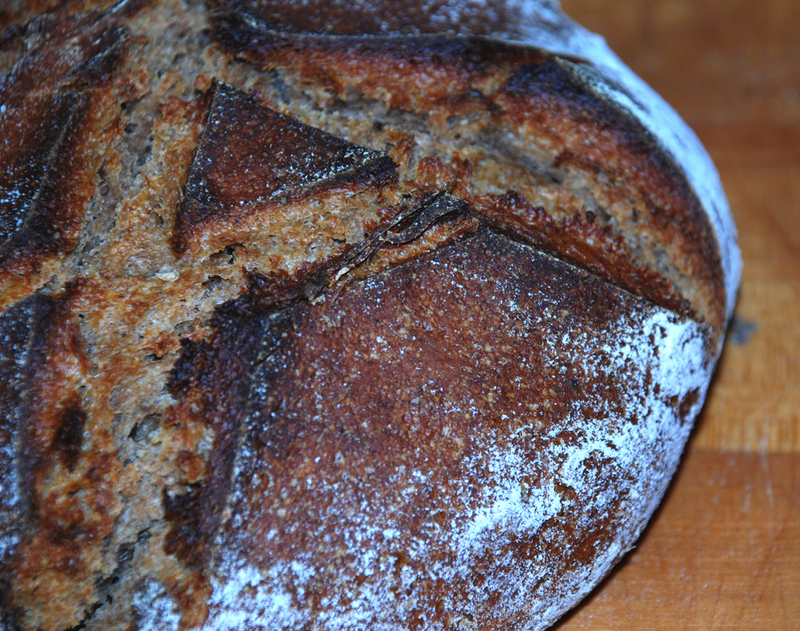 I decided to add some dark beer to give it an extra kick and also used First Clear flour instead of Bread or AP flour. I ended up keeping the dough in the refrigerator for an extended period since I ran out of time to let it rise completely at room temperature. 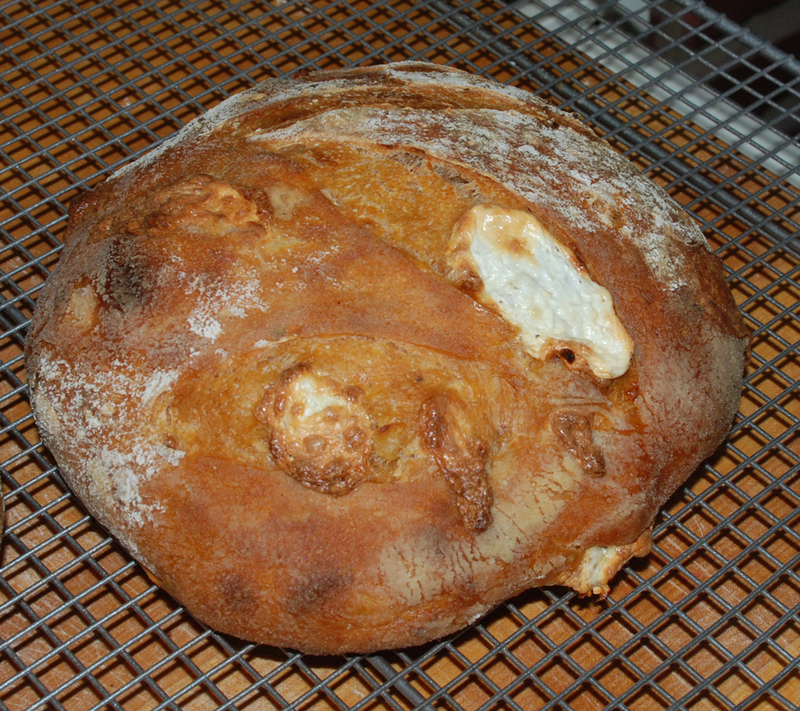 I think this ended up creating an extremely sour sourdough rye which is not for the faint of heart. If you want a more mellow tasting bread, I suggest you follow the directions below. 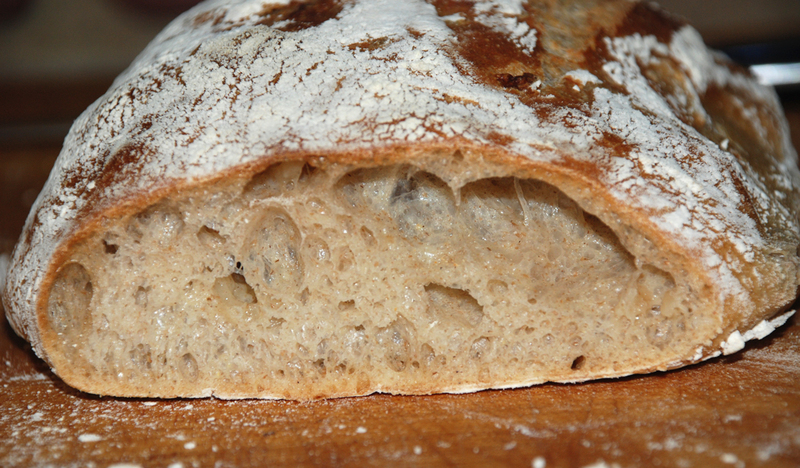 All in all, the bread turned out fairly well with a nice crispy crust and chewy, moist crumb. 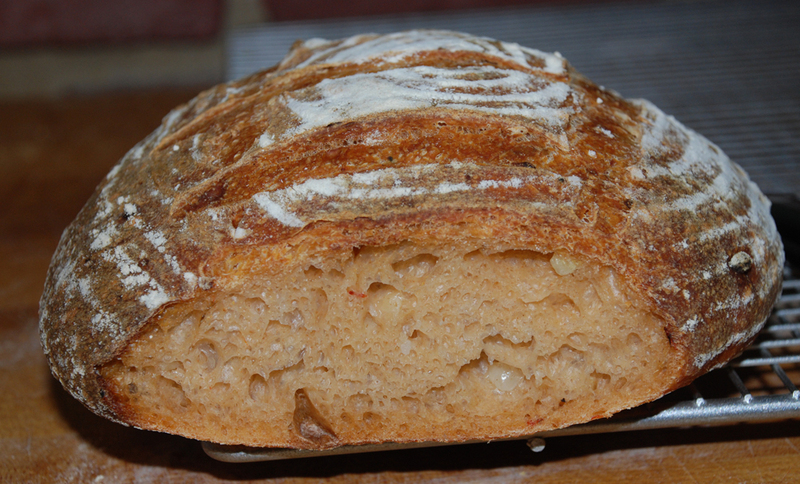 The beer definitely added another flavor profile which makes this bread ideal for a nice sharp cheese and beer. Prepare the starter and let it sit out at room temperature for 5-8 hours until it is nice and bubbly and ripe. You can use it immediately or put it in the refrigerator overnight until ready to use. Mix the starter with the room temperature beer and break it up. Next mix in the flours and salt until the dough comes together and is still sticky. You don’t need to over-mix the dough as it will now sit covered with some plastic wrap for 18-20 hours at room temperature. (This is the point where after around 8 hours I put it in my refrigerator). After 18-20 hours the dough should be nice and puffy and ready to turn out on an either a lightly floured work surface or lightly oiled one. 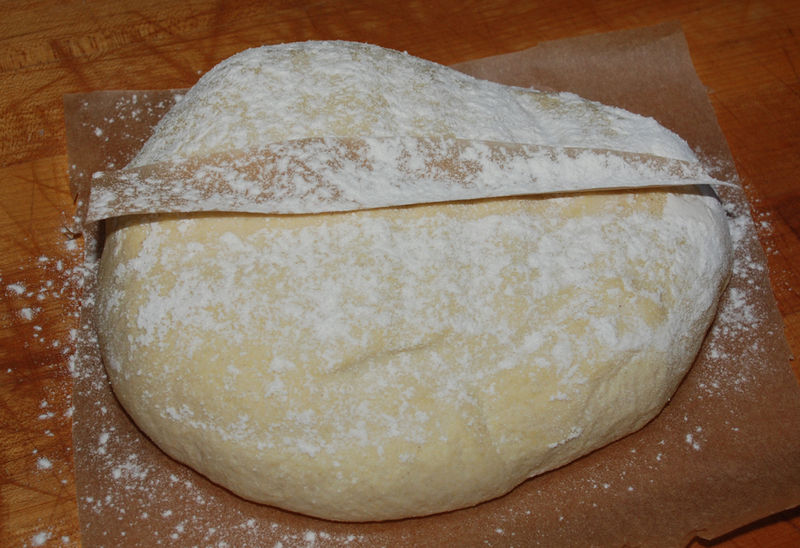 Do several stretch and folds and then put the dough in your floured banneton or bakers couche for its final journey which should take around 1.5 – 3 hours. When the final dough is nice and puffy and passes the finger poke test, prepare your oven for hearth baking. 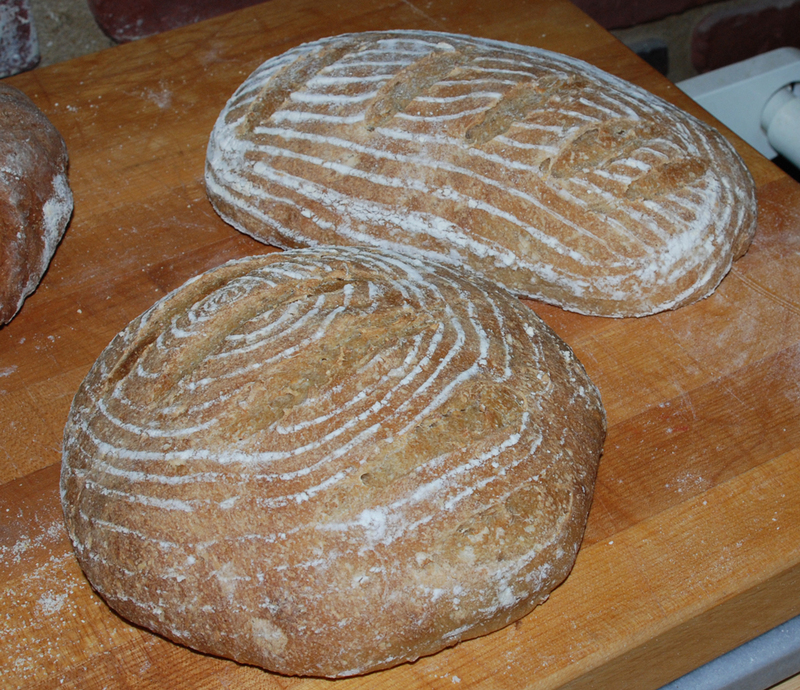 I get a kick out of trying new types of flours and grains in my bread baking. 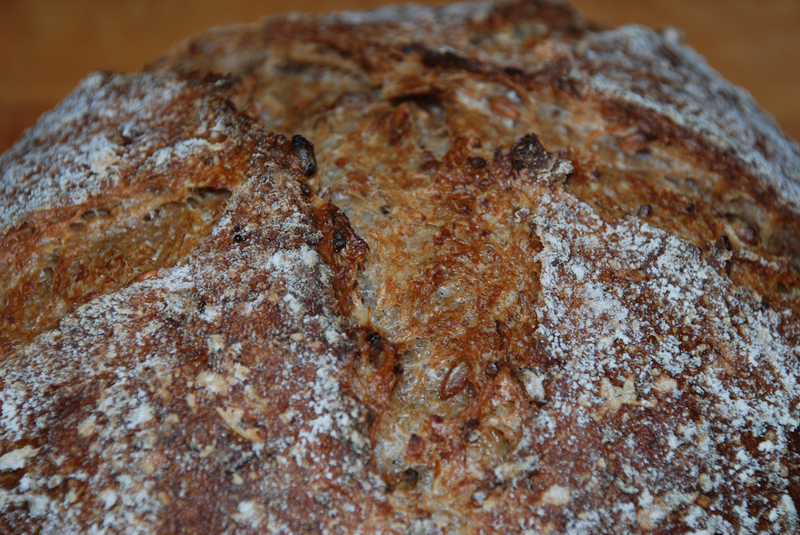 I frequently shop on-line at King Arthur Flour and like to try new and different products when I can. 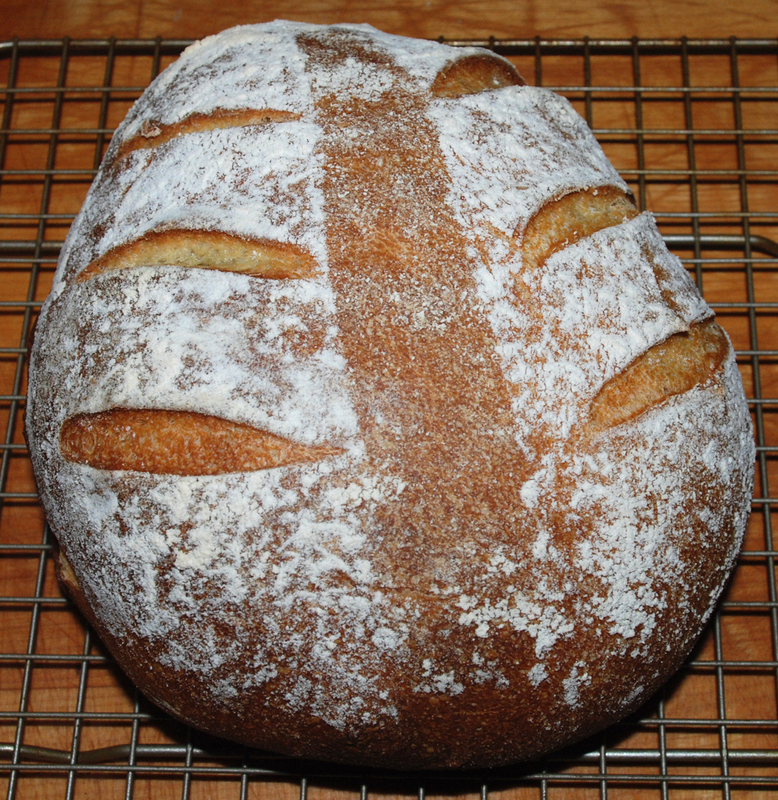 I’ve read many recipes on The Fresh Loaf using soakers and have tried a few recipes from Peter Reinhart’s Whole Grain Bread book with mixed results. I decided the other day to try my own formula using a multi grain soaker from my baking supply bin and also used some of my existing refreshed sourdough starter mixed with some rye, whole wheat and first clear flours. The results were surprisingly good considering I had no idea what to expect. 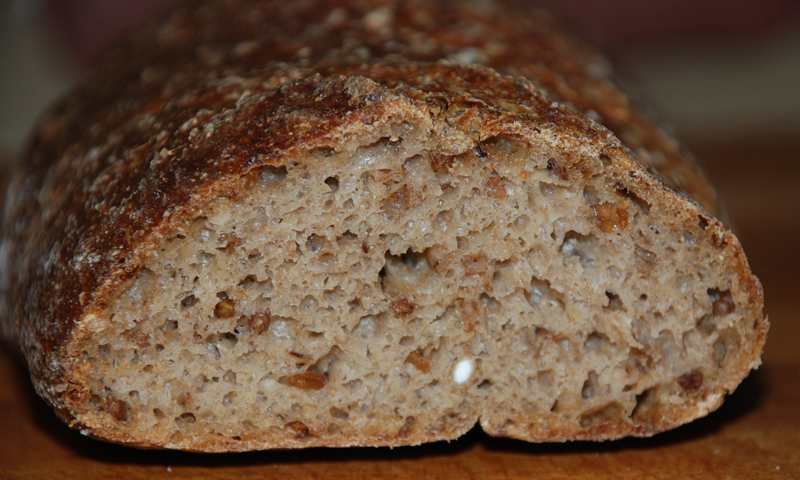 The final bread had a great nutty sour flavor with a nice thick crust and moist crumb. 6 oz. Water, 90 degrees F.
Mix all ingredients for soaker in a bowl and add boiling water. Let it sit for 2-3 hours covered until the grains are soft. After 2-3 hours add the soaked grains along with the remaining liquid in your mixing bowl and add the flours, salt and remaining water and mix for 2 minutes. The dough should come together in a shaggy mess and should be relatively moist at this point. Let it rest for 5 minutes and mix for 4 minutes more on medium low-speed. 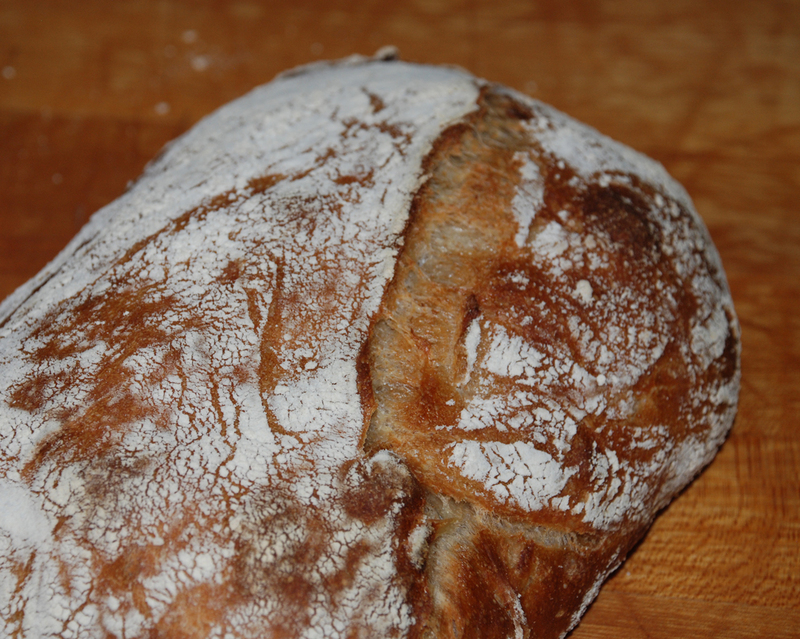 The last time I made Ciabatta I made a sourdough version that came out quite good. In my never-ending quest to try to create something new and hopefully great tasting I came up with the concoction below. I decided to go with a straight forward yeasted version of Ciabatta but I wanted to get more flavor in the final product. 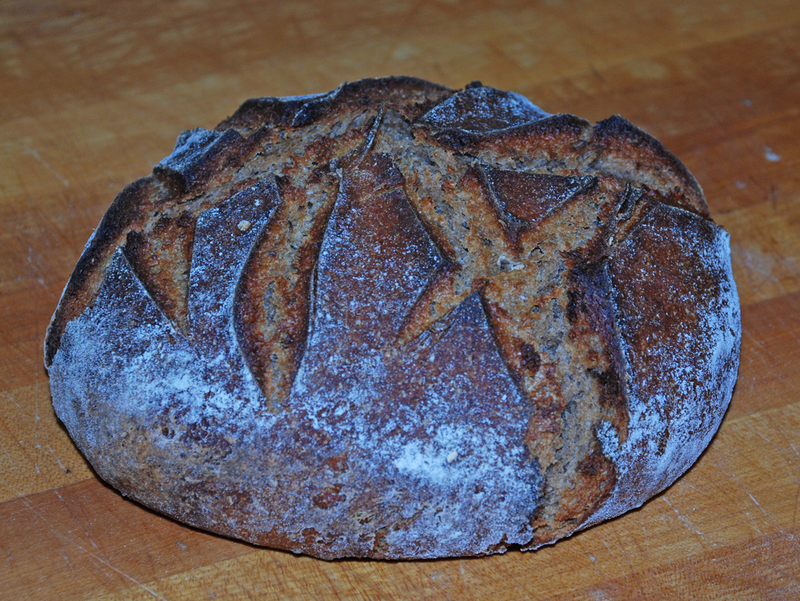 I happen to love onions, so I figured why not add some carmelized onions and to get some stronger wheat and nuttiness flavor in the bread I decided to use some spelt and rye flour along with a low protein French style flour from KAF. 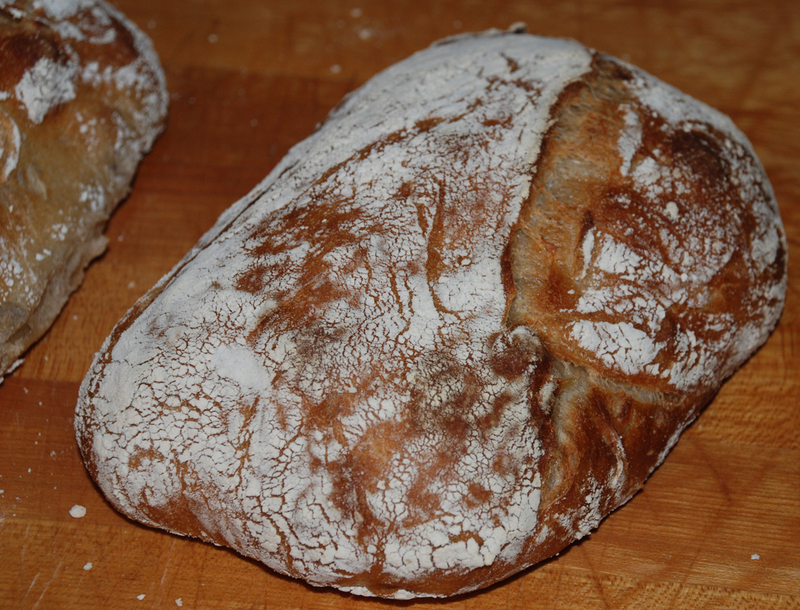 This combination resulted in by far the best Ciabatta bread I have ever made or tasted in my not so humble opinion :). I followed the standard operating procedures from Peter Reinhart’s Artisan Breads Everyday for the Pain a L’Ancienne Rustic Bread and modified the ingredients as mentioned above. The only thing I would change maybe is to add some cheddar cheese next time which would really put this one over the top. 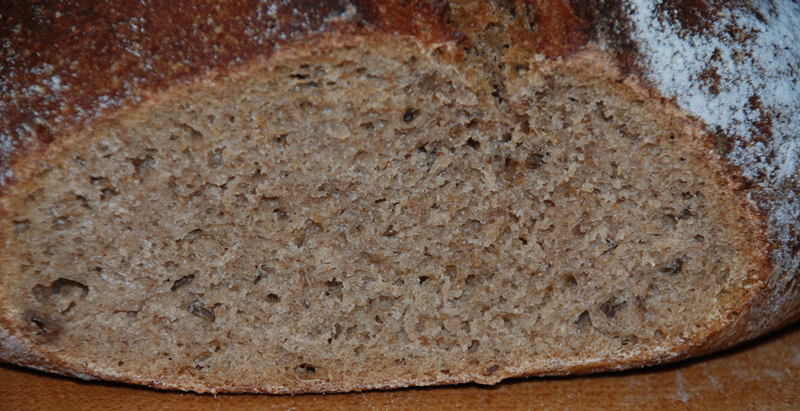 You can really taste the onions and the rye-spelt mixture and the open crumb was nice and moist. If you give this one a try I would love to hear what you think. Cut up half of a medium size sweet onion and saute for 5-8 minutes on medium low in a frying pan or bake on a sheet pan in your oven. Let the onions cool before adding them to the dough. Add all the ingredients into the bowl of your mixer except the onions and stir for 1 minute on the lowest speed. The dough should be rather sticky and rough at this point. Let it rest for 5 minutes in the mixer bowl. Add the cooled onions and mix on medium low using your paddle attachment for one minute. In my case I have a Bosch which only has one mixing/kneading attachment. The dough will still be very sticky but should very soft and much smoother. Transfer the dough to a lightly oiled bowl using a dough scraper or spatula. Cover the bowl and let it rest for 10 minutes. After 10 minutes transfer the dough to a lightly oiled work surface. Make sure you oil your hands and do a stretch and fold on all sides of the dough and flip it over and form it into a ball. 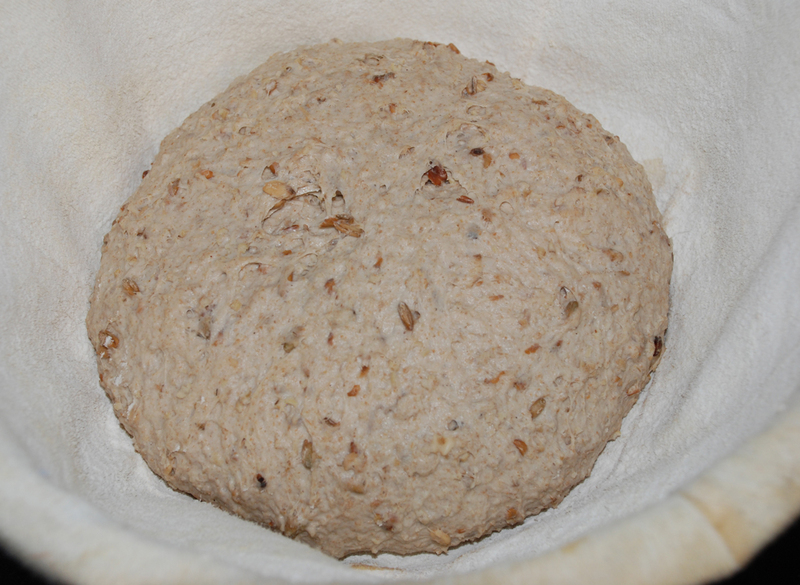 Put the dough back in the bowl and let it rest for another 10 minutes at room temperature. Do this stretch and fold process three more times over the next 30 to 40 minutes. You can do the stretch and fold in the bowl itself if you prefer. I personally like to do it on the counter. After you do the last stretch and fold put it back in the bowl and cover it tightly and refrigerate overnight or up to 4 days. 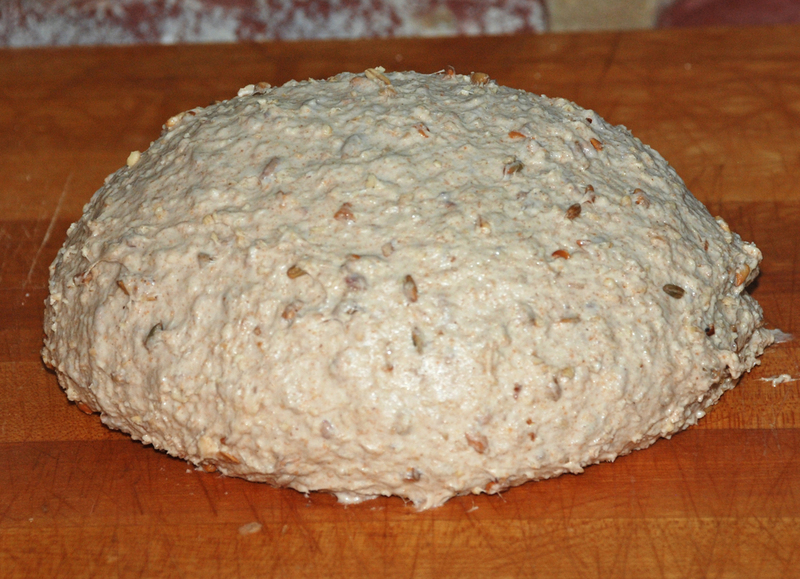 The dough should rise to almost 1 1/2 its size in the refrigerator. 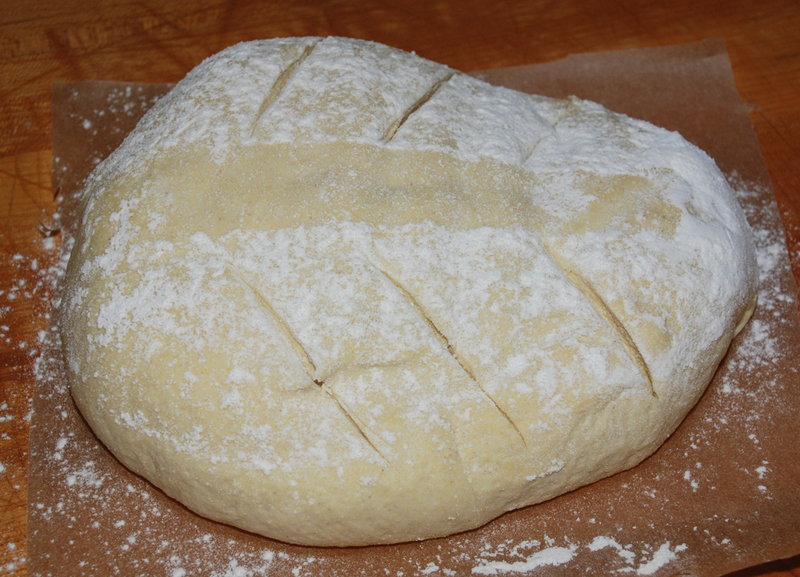 Take the dough out of the refrigerator at least 3 hours before you plan to bake and let it sit at room temperature. Around 1 hour after taking the dough out of the refrigerator, place a large piece of parchment paper either on your work area or the back of a baking pan and dust with flour to cover it completely. Using an oiled or wet dough scraper gently remove the dough to the work surface. You want to be very careful so you don’t degas the dough and kill the big air holes you want to achieve. 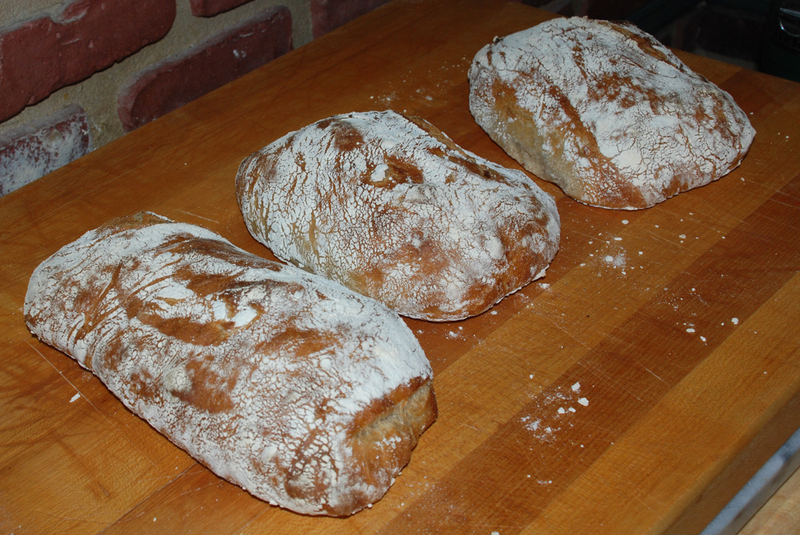 Next, cut the dough into either 3 small ciabatta or 2 larger size loaves. I opted to go with the 3 smaller size ones. I was in a creative mood the other day and decided to try something different. I have made semolina bread before but this time I decided to convert the starter over to a semolina based concoction along with a little whole wheat flour as well. My wife had bought a nice ball of fresh mozzarella so I figured why not incorporate some cheese and throw in some roasted peppers and roasted potatoes as well. The dough ended up very wet due to the roasted red peppers I used from a jar had a very high water content, so you may choose to add some additional flour as you are preparing the final dough. 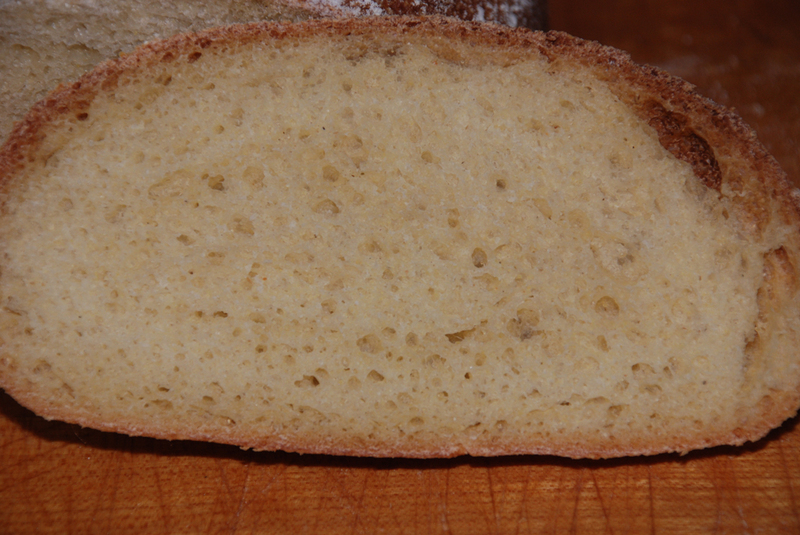 The final bread came out excellent with a nice reddish tint and a great open and crispy crumb. You could really taste the roasted peppers and the dough had an excellent sour tang. The only thing I would change would be to fold the cheese in before shaping the final dough rather than before putting it in the fridge for its overnight rest. Make the Starter by adding the water to your existing starter amount and mix for a minute to break it up. Add the flours and mix for 1 to 2 minutes until thoroughly mixed. Put in a lightly oiled bowl and loosely cover. Keep at room temperature for 5-6 hours until the starter becomes bubbly and doubles in size (I usually do this the night before and let it sit overnight). You can either use the starter right away, or cover tightly and refrigerate until ready to use. If you don’t plan on using it that day, you will have to refresh the new starter before using in the final dough. For the final dough, using your stand mixer or by hand, mix the water with the new starter to break it up. Add the flour, potatoes, salt, red peppers (chop them up into small pieces) and mix on the lowest speed for 2 minutes. Let rest for 5 minutes. After another 10 minutes do another stretch and fold and let it rest again for another 10 – 15 minutes. Do one last stretch and fold and then put it into a lightly oiled bowl that has enough room so the dough can double overnight. We had some left over avocados that were getting very ripe so I decided rather than throw them out I would try to incorporate them into a bread. I used 1 ripe avocado and mashed it up with a fork until it was the consistency of guacamole. I’ve also been wanting to try to add some yogurt into one of my breads and figured this would be a good combination with the avocado as well. 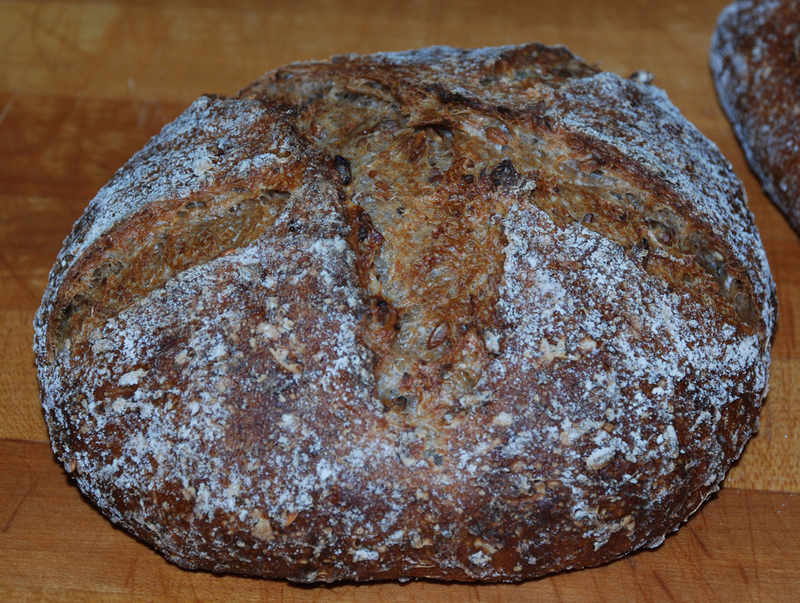 Just to make it a little more interesting I decided to add some barley flakes and spelt flour. I must warn you that the addition of the avocado and the yogurt ended up making this a very wet dough. If you prefer you can add more flour or give this a go but be prepared to work with a sticky dough. 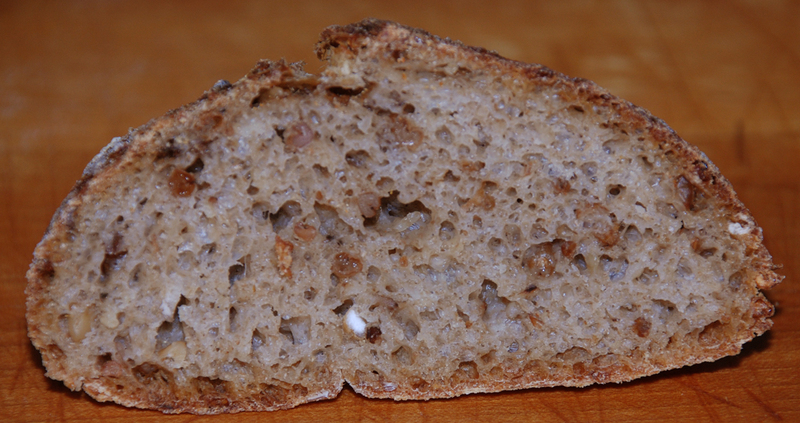 The final bread came out pretty good with a nice open and moist crumb and a good tangy flavor. The only issue I have is that I left the final dough to rise too long and it ended up getting deflated slightly which caused the end result to be a little flatter than it should have been. If you make this recipe and use bannetons to form your final loaves, be sure to use plenty of flour to prevent it from sticking. Add the flours, salt, avocado, yogurt and barley flakes and mix on the lowest speed for 2 minutes. Let rest for 5 minutes. 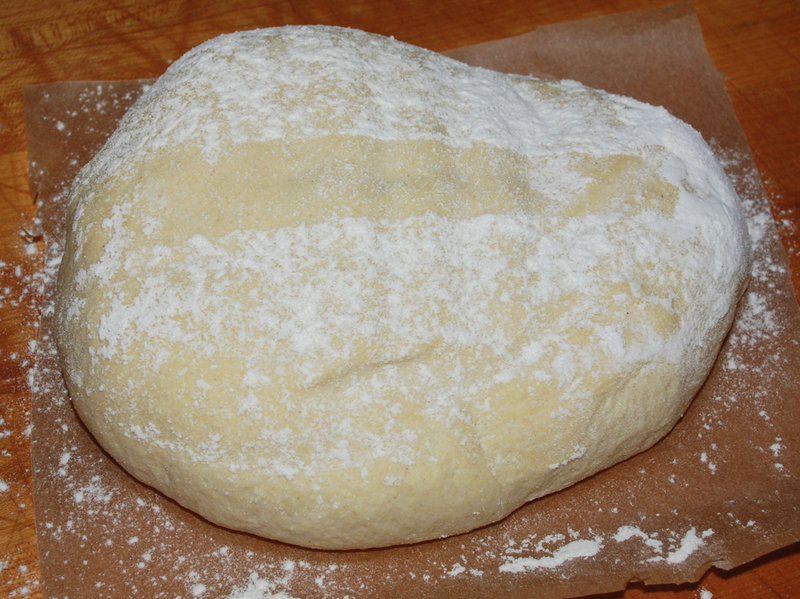 Remove dough to your lightly floured work surface and need for 1 minute and form into a ball. The dough will be very sticky so you may want to wet or oil your hands to help form it into a ball. Wait another 10 minutes and do another stretch and fold. The dough should start to become easier to work with at this point. Let it rest 20 minutes this time and do another stretch and fold. Let it sit covered in your bowl at room temperature for 1.5 – 2 hours and then put in your refrigerator for at least 12 hours or up to 3 days. 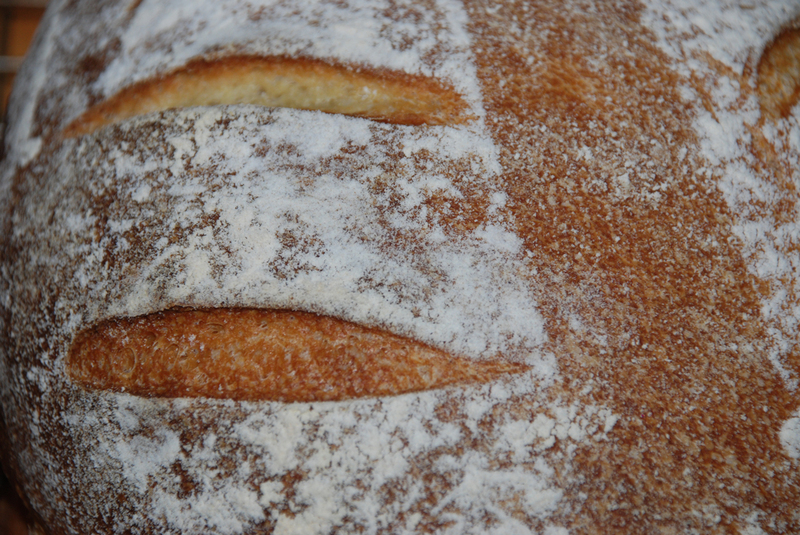 When ready to bake the bread, let it sit out at room temperature covered for 2 hours. After 2 hours shape the dough as desired being careful not to handle the dough too roughly so you don’t de-gas it. 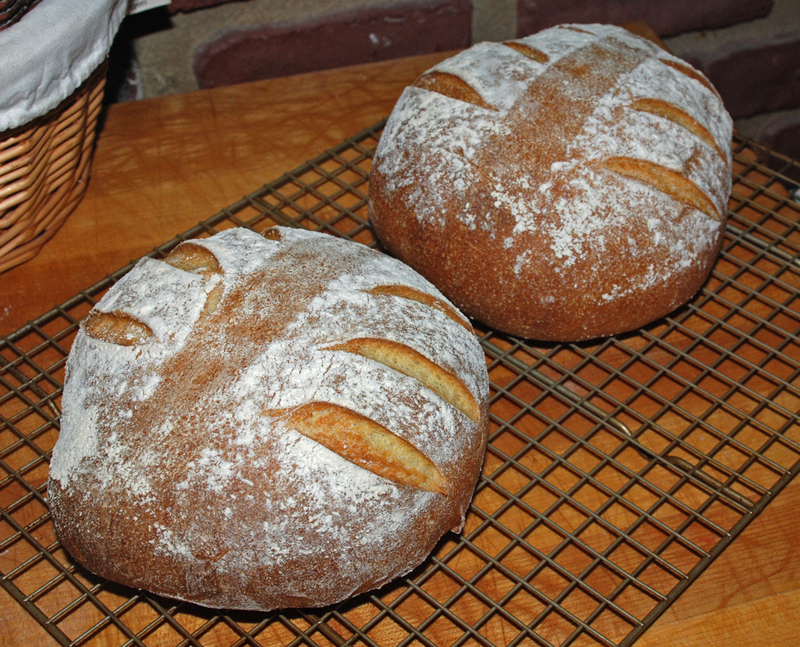 Pour 1 cup of very hot water into pan and place loaves into oven. I also spray the inside of the oven walls with water 2 times the first 5 minutes to add some extra steam. It’s been a while since I made my own pizza so I figured it was time to make a go of it again. I have been reading many posts about using 00 style flour and how it really only works best when you can get your heat source over 700 degrees. I don’t have the ability to do that just yet, so I decided to combine 50% Italian Style Flour from KAF and 50% KAF Bread Flour and see what happens. 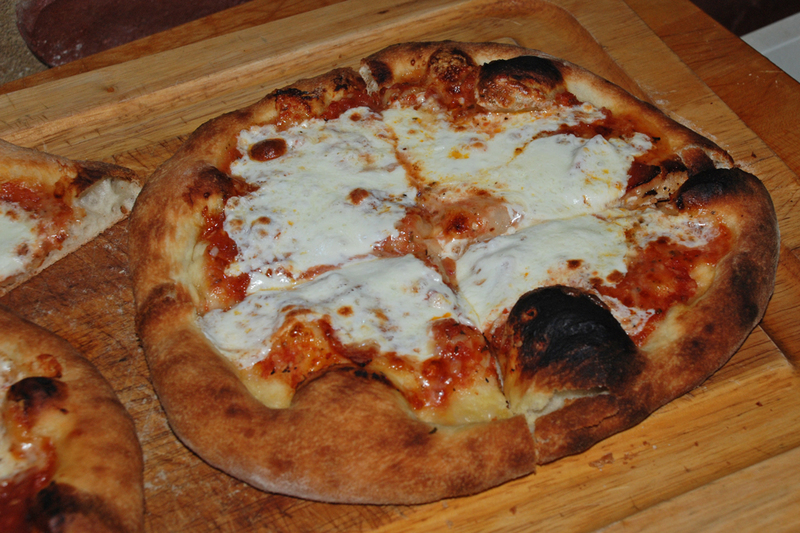 I adapted a recipe from Peter Reinhart’s Artisan Baking Everyday and after a couple of days with the dough balls resting comfortably in my refrigerator I decided to bake a couple of pizzas for lunch this past weekend. I recently read another blog by Steve B. at http://www.breadcetera.com where he suggested to put your pizza stone on the highest shelf of your oven and set your oven to broil. The purpose of this is to get as much heat as possible to be retained by the stone. I have to say it worked perfectly so give it a try! I decided to add some pepperoni and some parmesan cheese to add some extra flavor and I do have to say I was very happy with the end results. My wife did complain that one of the pies was a little soggy which was due to my putting too much sauce on the pie, but I ate it all anyway! One hour before you are ready to bake pre-heat your oven to the highest temperature and put your pizza stone on the highest shelf possible in your oven. Prepare your favorite sauce and get your cheese and toppings ready. I used a simple fresh tomato sauce consisting of 1 can of diced tomatoes with red peppers, salt, freshly ground pepper, oregano, basil, 1/2 of a lemon and a dash of red wine vinegar. 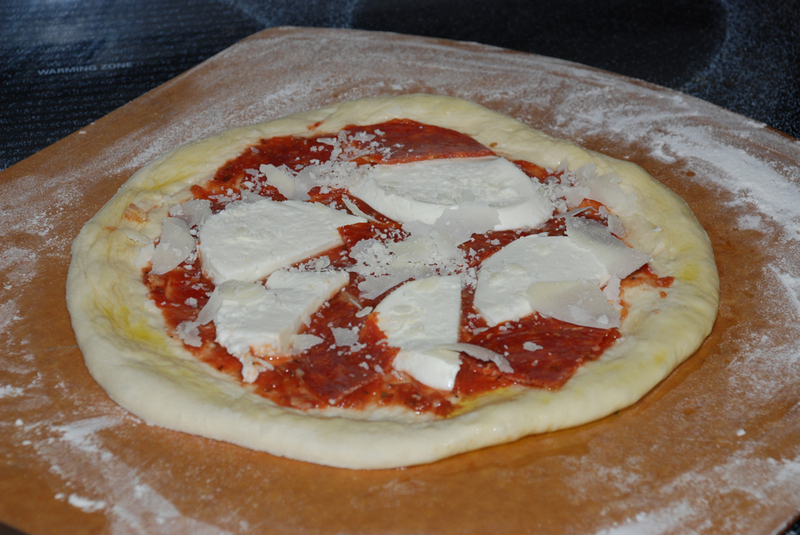 I also used fresh mozzarella, grated parmesan and pepperoni. Turn your oven on broil 10 minutes before you are ready to bake your pizza and get the stone as hot as possible. Assemble your pie and brush some olive oil on the crust if desired. You can either sprinkle corn meal or flour on your bakers peel and place the pizza on your peel before putting the topping on it. Alternatively you can put your pizza dough on a piece of parchment paper and slide the peel underneath when ready to put in the oven. The worse thing that can happen is for your dough to get stuck on your peel and make a mess in your oven, not to mention ruin all your good efforts. I strongly advise not to put too much sauce on this style of dough or you will end up with a soggy mess. Less is actually more in most cases of making a good pizza. This dough is also excellent for making calzones which I did a few days later. I added some grilled chicken, mozzarella, ricotta cheese mixed with basil, oregano and garlic salt and parmesan cheese inside and baked at 400 degrees for around 25 minutes. Just make sure you use a little water to seal the dough and cut some air slits on the top so the dough doesn’t built up too much pressure.